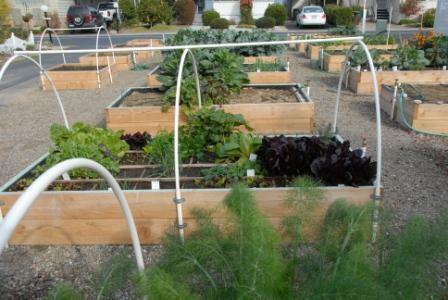 My brother from MN convinced me to begin a blog about our gardening experiences ... specifically this community garden. I finally did it. You can find the blog at wordpress but almost everything is the same as what both Al and I have posted here...with a few additional things. Just thought I'd let you guys know what we're doing! Yesterday was Al's birthday. I asked him what kind of cake he wanted for his birthday and he said "really decadent, and of course chocolate" ...and something round and also square. Sooooo, this is what he got! 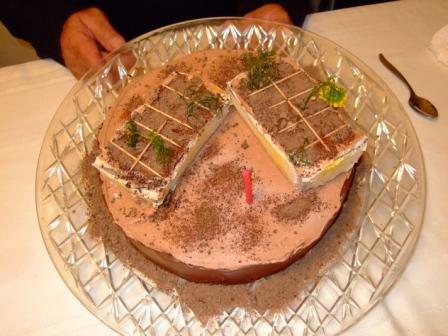 The round base is a split layer double chocolate cake with chocolate fudge filling. The two small "garden boxes" are the same cake, no filling but all the frosting was super chocolate. Coffee was the liquid I used to make the frosting. The little green things in the SFGs were fennel fronds, yellow mustard flowers, and white cilantro flowers. The grids for the SFGs were toothpicks. Oh, yeah...the "dirt" was frozen chocolate chips run through the grinder! We had fun with it. My grandsons thought it was great fun. Al loved it and our entire family thinks he and I've both gone a bit nuts with this gardening thing. Love it! What a great Birthday Cake for Al. You did a wonderful job. Yesterday Al and I cleaned up our garden boxes. We trimmed and removed several things...things like the yummy Swiss chard we had for dinner! We also added some hoops that will become the frames for the plastic sheeting that will protect from frosts. We followed the suggestion of the guys at the landscaping place...leave the long pieces of PVC in the sun to warm them before bending or they'll break. After a few hours in the garden we were finishing up and placing the last few sticks for hoops in the sleeves. Al was drilling a hole through the top straight piece when suddenly the bent hoop piece snapped. In an instant that thing split at the top of the bend and snapped back to smack Al right on his nose!!! I was on the other side of the garden box, a bit off to the side so I didn't get hit, but poor Al was over the top of the darned thing when it popped. OUCH!!! We are using a thinner 1/2" PVC than what you get at OSH or Home Depot so it will fit down inside the 3/4" for the sleeve. We're not sure what caused it to break...the weight of him pressing down with the drill, the thinness of the wall of the pipe, or because the temp had dropped in the late afternoon. Or maybe all of the above?! The moral of this story?? Maybe find a different product. Maybe use it only in the warm sun. Maybe consider your wife's suggestion to drill the holes first while the pipe is flat on the ground???? Naaahhh, that would be too easy, right? Poor Al! His first gardening injury. But a valuable lesson learned. Shooting stars over the garden! This morning Al and I got up at 4:45am and took chairs out to the garden to watch for shooting stars. The local weather guy had said there would be a meteorite shower a few hours before sunrise. I checked the sunrise time before we went to bed...6:47 so I figured by 5am we should be in the middle of the sparkles...Wrong! We sat there for about 20 minutes...me all snuggled in a Snuggy on backwards...Al just in sweatshirt/sweatpants and socks. Geesh! It's dark outside, it's cold outside...ya'd think he would have dressed for sitting out there! I wanted to stay for another 30 or so minutes but didn't want to stay out there by myself (I'm not as brave as I pretend!) so we came back inside and back under the warm covers. At least I saw one!! Al didn't see any. The garden looked so beautiful with just the street lamp lighting it. We were slammed with rain yesterday and last night! Today was sunny off and on, mostly off, and a bit windy with more rain due in again tonight. The broccoli in one of the newest boxes, the one that blew over in the last storm and became an "L" shape was again blown over. Hopefully the poor thing has a good root system! The rest of the boxes seemed to do well. I'm amazed and really pleased with the super drainage we have all around the garden boxes...the gravel/rock combination over the sandy soil means no standing water...Yay! Al and I are visiting my daughter and grandsons until Thursday morning in Mountain View, CA so we won't know what's happening in our Apollo Garden until we get home again. Crossing our fingers that the heavy rains don't wash out the newly planted seeds. This storm is way earlier than normal winter storms of this size, according to the local meteorologists. This morning before we left Al and I were commenting on the levels of soil in the garden boxes...ALL of the boxes have settled by several inches. I thought my garden box might have settled the most, it being entirely MM. I was wrong! All the boxes seem to have settled just about the same amount...around 4" since we filled the boxes in late July. Interesting! That's good to know that the other soils are settling just as much -- it's not just us and our MM, then! @LaFee wrote: That's good to know that the other soils are settling just as much -- it's not just us and our MM, then! I agree, LaFee! I was concerned that my garden of entirely MM was really settling way too much until I saw all the boxes from our front door. Our raised porch allowed me to look over the boxes and compare them. Because the soil was still wet from the rains the contrast with the dirt made it really easy to see how much had settled. 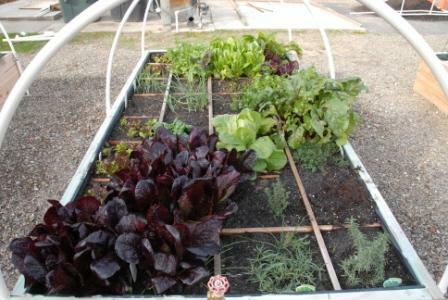 We have 16 of the 4x8 boxes and 4 of the 4x4 boxes in our Apollo Garden. Mine is the ONLY one to use MM, and I tried to keep it as an experiment...to see how the seeds sprouted and how the plants grew and produced. Honestly...I've now had to add some MiracleGro becauses my plants weren't as big, nor producing the same as other boxes. There is only one other possibilty...mine gets a little more shade than the others, less of the really hot sun, but maybe that's enough difference to cause the plant size difference. This was our first season, actually only part of the season. 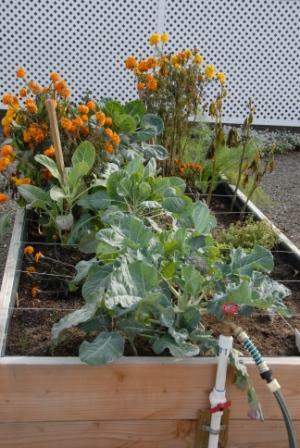 We planted our first seeds on July 31, 2010, then began planting the broccoli, cabbage, cauliflower, and Brussels sprouts in late September. Other gardeners who planted in August, with only sandy topsoil, our city bulk compost, and one bag of MiracleGro have had abundant harvests of their beans, turnips, okra, and snap peas. Kinda embarrassing since I'm the "ring leader" of this whole project, and the one constantly spouting off about the Square Foot Gardening...and of course about the amazing Mel's Mix! Don't get me wrong, I still firmly believe in MM, I just think that for my garden box, located in a bit less sun than the others, might need a boost now and then! PNG, I am a firm believer that MM is only as good as the compost that goes into it. I did not have much of a choice in my area, and I believe the compost I used in my first boxes was poor. Some of my plants did not grow well until I added bone meal for phosphorus, blood meal for nitrogen, and epsom salts for magnesium. I would have added greensand for potassium if I could have found it, but the other amendments did the trick and the plants took off after the amendments were added. Bottom line is, IMO if you don't start with good compost you may have to add supplements to bring it up to where it should be in fertility. @ander217 wrote: Bottom line is, IMO if you don't start with good compost you may have to add supplements to bring it up to where it should be in fertility. Thanks ander, this is exactly where we went wrong. We were newbies with the MM and used less varieties of compost than we should have. Also, the cost was a factor...but in the end we're still gonna have to add more "stuff". The one thing I would tell ALL newbies is you MUST start with good compost, don't worry so much about the vermiculite, concentrate on the compost! 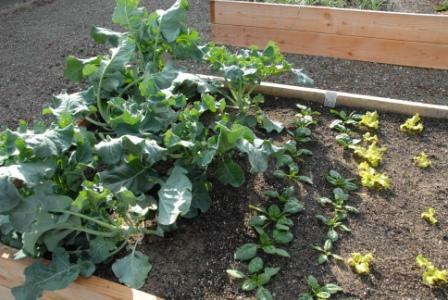 The other garden boxes in our community garden that are doing so well have absolutely no vermiculite...but they had better compost, and more of it! We've learned a ton about SFG and gardening in general during this short time we've had the Apollo Garden growing...thanks to all the great folks like you here on the SFG forum! Sheila, you must be very proud of yourself and everyone who has helped you to bring you idea to fruition. This is the best and most encouraging piece of writing I have read anywhere. With the photos and the writing being so clear and descriptive I can almost, no, I can see a movie in my mind of you all working away on your gardens, picking your crops and cooking and eating them with big grins on your faces . I hope it continues for many years to come. Long live The Apollo Garden. I just hope I can do mine half as good, for the story. @jumiclads wrote: I just hope I can do mine half as good, for the story. WOW, thanks for the great compliments! Sorry for the delay in saying thanks...we were caught up in the whole Thanksgiving and family stuff. Hmm, I should say...stuffed! We've now had 3 full days of big meals...we're as stuffed as those turkeys were!! We were out of town for most of this past week and couldn't cover our garden boxes. We knew the temps would be in the 20's, but there just wasn't anything we could do from 86 miles away! One night was 29, the next 28 and the last was 27 degrees...way too cold for a lot of the stuff planted out there. Imagine our surprise when we returned early Thanksgiving morning and rushed to the garden to see the damage...and there was very little! ALL the lettuce had survived...it sure doesn't in the fridge when it gets frosty! There was still frost on most of the plants at 9:30am, and it was beautiful!! 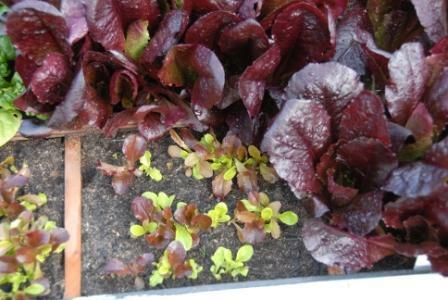 The red frilly edged lettuce leaves looked like they had ruffles of white lace. Some of the wider leaves of the broccoli had intricate ice crystals that just glistened in the sun. We were soooo happy that not all our hard work had been frozen! The little broccoli head (just above the top of the faucet) is doing well. The marigolds and okra...not so much. Broccoli belonging to a newbie was blown over but still struggles to survive! His spinach and lettuce made it just fine! He came over to water his plants and discuss the poor blown over guys! 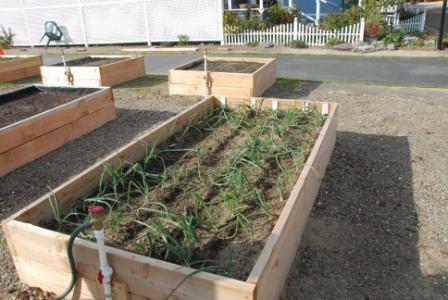 Our determined "row gardener" has some good looking garlic and onions, but he insists this is because he put them in rows and keeps making mounds around them. Uhhh, OK, if you say so! My garden doing well. Hey Chopper, I had my brother sign the box too!! 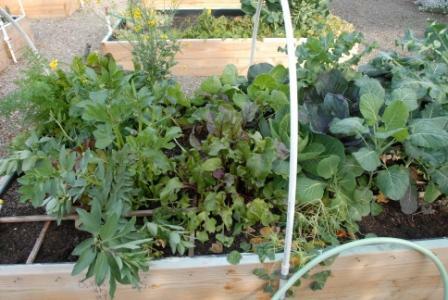 The lettuce and herb box...no damage here at all! These are not drops of dew, rain, or from the hose on the lettuce leaves...these are from the melting frost! 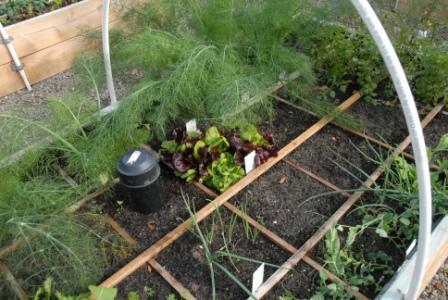 Al's fennel is doing soooo well now, guess it really likes this colder weather. Sure hope those red wigglers down the worm tube are still doing OK! The food is slowly disappearing so we think they're still alive down there! 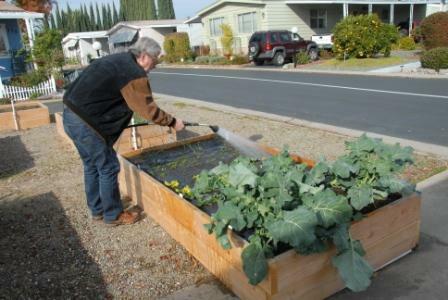 This is the view of most of the garden boxes on Thanksgiving morning. This is why Al and I are so thankful! Hope you've enjoyed seeing our November Apollo Garden. Al and I watched our weather reports and it looks like we won't start building the greenhouse until next Monday. We should have several days of clear weather during the first of next week. I can hardly wait!!! Your Apollo Garden turned out very nice. I am sure your mind is swimming with new plans. And the excitement of a greenhouse. Then --soon--the excitement of germinating seeds. The mind can go crazy with excitement. I share your feelings. We are building a new hoop greenhouse too and then I have to construct a germination chamber which is a mini greenhouse inside the greenhouse for extra protection and lowers heating bills. I can't believe how the time has just disappeared since my last post! I was soooo excited about getting the greenhouse up and ideas for what to plant, etc, etc...then the rains started so we delayed hoping for some clear days. And then??? Well, Al and I make tamales this time of year for our families...and this year we branched out and actually took orders for them. We've been swamped, making tamales round the clock on some days, and delivering on others. Such fun, great family stuff...but it's really cut into our gardening time! Al came back in the house a few days ago fuming about a cat getting into his garden box. We took a good look and I'm still not convinced this was a cat. My guess is a possum. I had them destroy my garden and flower beds years ago and this sure looks like the same thing. We put bird netting on all three of our garden boxes and a few of the other gardeners have done the same thing. Up until now we haven't had problems with any critters, other than those darned worms we battled a couple of months ago! Hmm, the interesting thing is that this new critter was in the garden during the night, and recently we put up our Christmas lights, using the same cord/timer as the Bug Zapper. I changed the setting for the timer to go off at midnight so the Bug Zapper wasn't on during the full night. When it's on all night the entire garden area is lighted...not what those night time critters like! As of last night the Christmas lights are on a different cord/timer and the Bug Zapper is back to working all night. Hopefully the new critter gets disgusted and goes away. The most interesting part of all this is that the critter only dug up the squares that Al and another gardener had just planted. Some of the other boxes have empty squares or areas but they haven't been touched...only those newly planted...AND these had been fortified with new compost/Dr Earth/etc...maybe the new smells attracted the critter? Or the worms hiding in the soil came up to search for food and the critter dug them up for it's dinner?!! OK, time to get back to another batch of tamales! PM me if you'd like to know more about our Californio Tamales. We use recipes handed down from over 200 years ago. It could be the smell. I know my dogs are sure they will find a fish in there whenever I put in some fish emulsion. The freshness of the compost may well attract critters. The critter hit a couple more garden boxes even with the light on all night long so Al set a cat trap a couple of nights ago. Sure enough, yesterday morning there was a very large feral cat in the trap...and he didn't even touch the can of cat food! Another feral cat was caught in a trap at our neighbor's house so Al and the neighbor gave the two cats a ride to the Animal Shelter...both were toms so at least we'll have a few less kittens around here! Hopefully the other cats will stay clear of our garden boxes. Hey, ya know what they say about all us older folks...it has something to do with treachery and experience, but I can't remember the rest! In spite of the heavy rain we're getting, and will get over the next few days, the gardens are looking great! When it stops raining we'll take some new pics and post them. Wow, the time just flies!! Here's our latest update...the critter, a cat, or a few cats, are still making nightly deposits in some of the garden boxes. Irritating, especially to Al, but with most of the boxes now covered with a type of bird netting, only a few of the remaining boxes are invitations to the cat. We've had a few more nights of freezing weather, nothing too bad so all the new lettuce is doing well, the huge broccoli, cauliflower, and Brussels sprouts is lovin' the cold weather, and all the onions and garlic are reaching for the sky! The garden is gorgeous...and when the rain darkens the soil and changes the color of the wood boxes to golden...everything about the garden is unbelievably beautiful! Many of us have been pouring over the arriving catalogs, drooling over the delicious looking tomatoes and other yummy veggies, and of course, ordering way too many seeds for more plants than we'll ever have room to grow! But hey, Spring is almost here...really!! The major project now is to get the greenhouse assembled. The rain has kept us inside looking out during the past few weeks but now it seems like we'll have several weeks of damp, foggy weather coming up...but not much rain. Hopefully we can build the greenhouse soon and start all our little seedlings. I think the building and the arrival of the seed packets just might happen at the same time!! I'll post pics of the greenhouse work as it happens...should be kinda hilarious because it might become a group effort...with quite a few opinions on how it should be done!! Looking forward to seeing the progress on the greenhouse. You did say that the cats are not bothering the boxes with netting, right? I wonder why those few gardners are not participating in the netting? Are they still growing crops in their boxes? Sorry to hear that the cats are still a problem in the Apollo Garden. @Furbalsmom wrote: I wonder why those few gardners are not participating in the netting? Are they still growing crops in their boxes? Ya know, Al and I have wondered the same thing! We've told all the gardeners about the cats, we've suggested they get some sort of netting or something over their boxes to deter the cats, yet they don't. We also have noticed that a few of the boxes are now on "auto-pilot" ...the owners haven't been to the garden in over a month. The boxes need a few weeds plucked out, but other than that the spinach and onions in one are doing well, the broccoli, lettuce and spinach in another are just growing...the rain has kept things wet enough...but the garden boxes look a bit sad...nothing you can really put your finger on, just a feeling I guess. The other boxes, the well tended boxes have plants that seem to stand taller, look brighter, and just have a happier aura about them! Yeah, I might see things differently than some of the other gardeners...but just walking through our Apollo Garden can brighten the gloomiest fog covered day! @PNG_Grandma wrote: Ya know, Al and I have wondered the same thing! We've told all the gardeners about the cats, we've suggested they get some sort of netting or something over their boxes to deter the cats, yet they don't. I guess some people don't want to get out in the gloom, and then some may assume their season is over for now. @PNG_Grandma wrote: Wow, the time just flies!! Here's our latest update...the critter, a cat, or a few cats, are still making nightly deposits in some of the garden boxes. Irritating, especially to Al, but with most of the boxes now covered with a type of bird netting, only a few of the remaining boxes are invitations to the cat. "Get someone to attach a motion sensor (just like you have for an outside light at night) that is 'looking over your garden' to a timer for the garden sprinkler (set it to run for about a minute or so). Then place the sprinkler in the middle of your garden. Every time the cat (or any other animal) goes to do a poo in the garden the sprinkler starts and it gets wet - and don't they just hate that! "